Emergency first responders were called out for a single-vehicle crash on S.E. McLoughlin Boulevard, just north of the Tacoma Street Overpass, at 11:57 p.m. on Wednesday, January 16. It was a spectacular smashup, and several TV news trucks turned up to report on it. Evidently the four-door compact SUV with Washington license plates had been southbound on McLoughlin Boulevard at a high rate of speed. The driver tried to turn west off to the highway at the Tacoma exit, but was going too fast to make the turn. 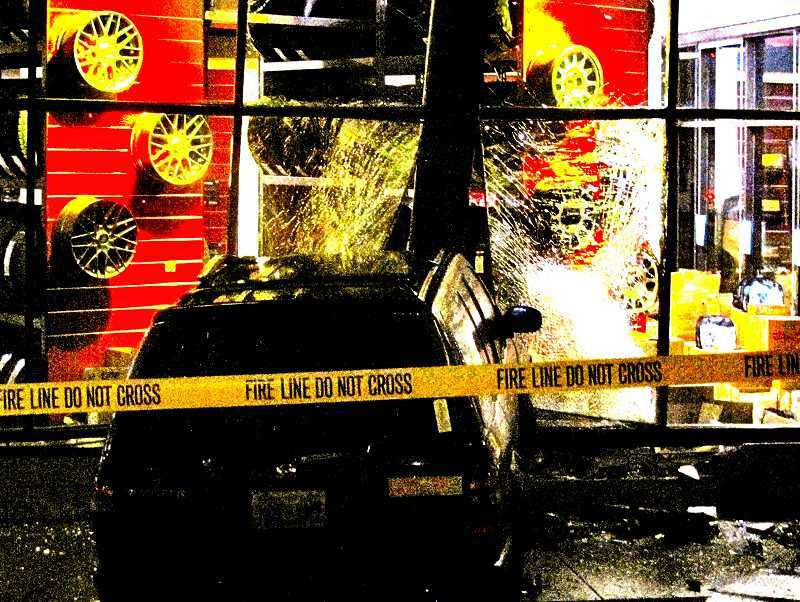 The vehicle jumped the curb, braked across a strip of grass, took out a sign, and skidded through landscaping, before smashing into a plate glass window on the east side of the Sellwood Les Schwab Tire Center. The car was finally brought to a stop by the large building support pillar it dislodged. The driver may have been impaired, and could indeed have been injured in the wreck, since the air bags went off. But whoever was inside managed to get out and run off. Police say the driver hasn't yet been located. Portland Fire & Rescue responders found the car unoccupied; but, after examining the building's pushed-in support pillar, declared the building to be structurally sound. The store opened on time the following morning.